Figure 1. This is Fig. 1 from Bromaghin et al. 2015 2014 in press, showing the study area. 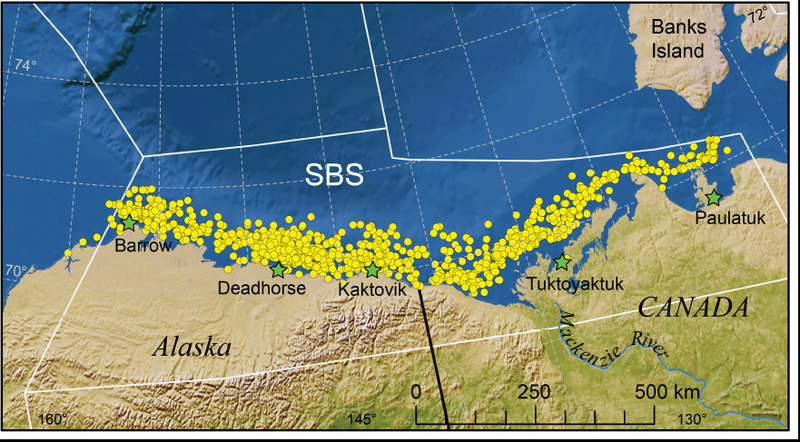 Note about half of the Southern Beaufort Sea subpopulation is in the USA and the other half is in Canada. Canada has recently moved the eastern boundary to ~ Tuktoyaktuk. Despite the known importance of sea ice, measures of ice availability did not fully explain short-term demographic patterns in our data, suggesting that other aspects of the ecosystem contribute importantly to the regulation of population dynamics. 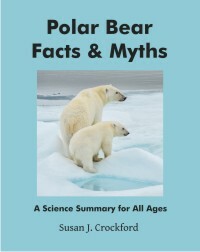 For reasons that are not clear, survival of adults and cubs began to improve in 2007 and abundance was comparatively stable from 2008 to 2010 with approximately 900 bears in 2010 (90% C.I. 606-1,212). 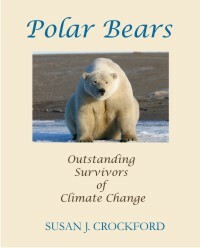 However, survival of subadult bears declined throughout the entire period. Note that summer sea ice was the only ice condition they examined. And note that the second-lowest September sea ice minimum, which occurred in 2007, was the point at which survival of adults and cubs began to improve. According to the USGS press release (pdf here), the 2010 estimate of ~900 bears (range 606-1,212), which appears to represent the USCA estimate (see Fig. 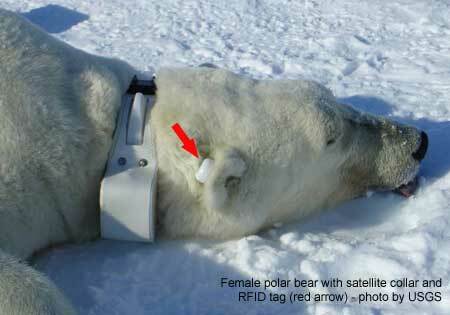 1b), will be included in the next Polar Bear Specialist Group Southern Beaufort assessment. The previous estimate (Regehr et al. 2006) was 1,526 bears (range 1,211-1,841) — but used a very different method. As far as I can tell, Bromaghin et al. 2015 2014 appears to be a re-analysis of Regehr et al.’s (2006) data with a few more years added. Oddly, Regehr et al. 2006 found a statistically insignificant decline from 2001 to 2006 while the re-analysis by Bromaghin et al. (2015 2014), using a new and improved method developed by Bromaghin et al. (2013), found a substantial decline and only a moderate recovery between 2001-2010. Are the large decline and modest recovery real — more real than previous estimates? In my opinion, it will take a very long and careful examination by modeling experts to determine that answer. Contact me if you would like a copy of the paper. Final, in-print version of the paper is open access. More details below on the methods. 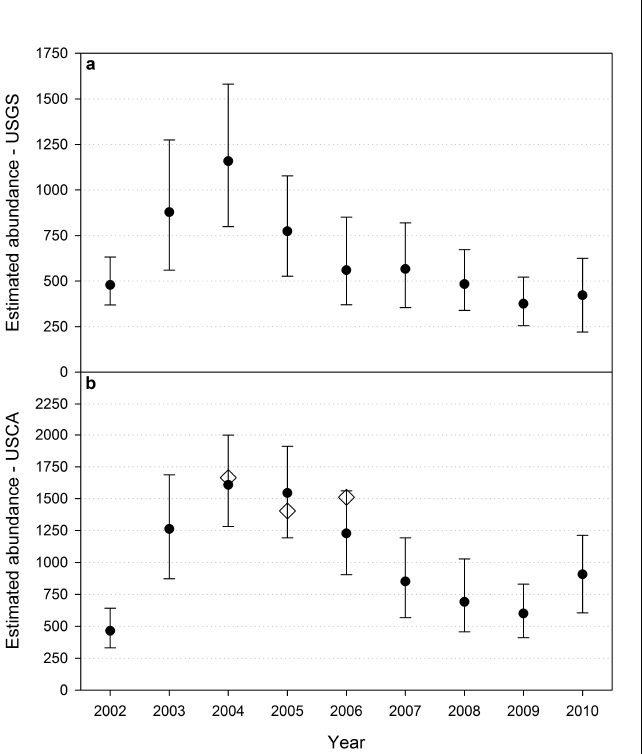 “Annual abundance estimates based on the USGS data, applicable to the Alaskan portion of the study area, ranged from 376 in 2009 to 1,158 in 2004 (Fig. 5a). We suspect estimates in the first two years, particularly 2002, were negatively biased by the absence of capture effort from Barrow in 2001, which may have caused an over-estimate of recapture probability in 2002 (Appendix C, Fig. C1-C3). In addition, the mixing of marked and unmarked individuals may have been incomplete during the initial years of the study (Appendix D, Fig. D2). The unusually large number of bears captured in 2004 (Table 5) produced a seemingly large estimate with a wide confidence interval. Even though there is uncertainty regarding abundance levels in these years, the broader pattern of a decline in abundance during the middle of the study followed by relative stability at the end of the study was consistent with patterns in survival. Abundance estimates based on the USCA data ranged from 464 in 2002 to 1,607 in 2004 (Fig. 5b). As with the USGS data, we suspect estimates for the initial years of the investigation were less reliable than those in the latter years, particularly because no capture effort occurred in Canada before 2003 and our models were not robust to this deficiency. Period of the study: 2001-2010 (2001-2005 used previously in 2008 ESA assessment). Season of capture: Approximately late March to early May each year (April/May in Canada). Apparently, the condition of bears in summer and fall was not considered. Method of capture: Bears were chased with helicopter, sedated, tattooed, ear tags attached; some adult females fitted with satellite radio collars in all years except 2010. 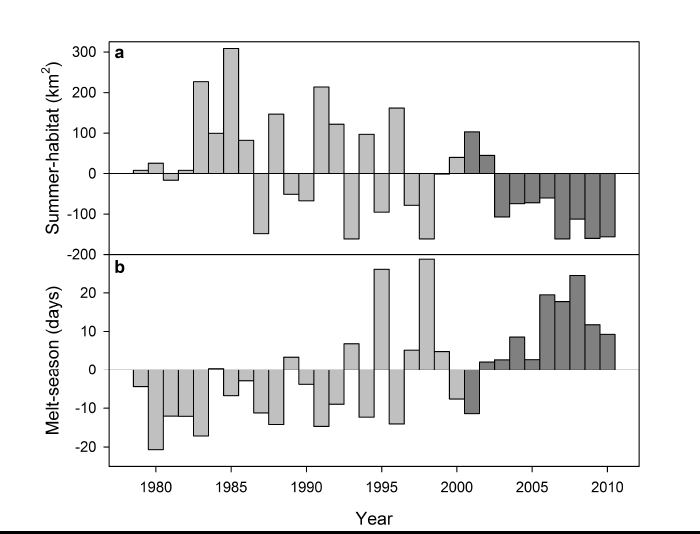 Sea ice relationships: They used only “summer-habitat” (area of optimal polar bear habitat available for July through October) and “Melt-season” (the time between melt and refreeze in the Beaufort each summer). Areas of capture: US half (called “USGS”), 2001-2010 (late March-May); Canadian half (called “USCA”), 2003-2006 (April and May) and 2007-2010 but not to the eastern boundary (with subadults and females preferentially targeted). Therefore, the sampling effort was uneven: there were no captures in the Canadian half of SBS from 2001and 2002 and captures were biased towards females and subadults in 2007 through 2010. But it appears to be the Canadian (“USCA”) population estimate for 2010 that is being accepted as representative. Go figure. Method of abundance estimate: They used “open-population Cormack-Jolly-Seber (CJS) models” developed by Lebreton et al. (1992), same as used by Regehr et al. 2007, 2010 (for SBS) and Stirling et al. 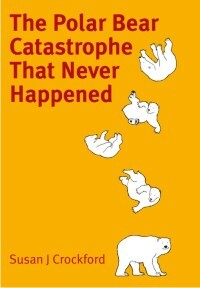 2011 (for NBS). Harvested animals were accounted for, they said. Survival probabilities used by the model were calculated for cubs, yearlings, subadults and adults. Method of evaluating models: They used a new “improved method” of evaluating the models described above, which involved computer simulation (Bromaghin et al. 2013, an open access paper listed below). Bromaghin, J.F., McDonald, T.L., Stirling, I., Derocher, A.E., Richardson, E.S., Rehehr, E.V., Douglas, D.C., Durner, G.M., Atwood, T. and Amstrup, S.C. 2015. 2014 in press. Polar bear population dynamics in the southern Beaufort Sea during a period of sea ice decline. Ecological Applications 25(3):634-651. http://www.esajournals.org/doi/abs/10.1890/14-1129.1 Open access. Regehr, E.V., Lunn, N.J., Amstrup, S.C., and Stirling, I. 2007. Effects of earlier sea ice breakup on survival and population size of polar bears in western Hudson Bay. Journal of Wildlife Management 71:2673-2683. Stirling, I., Schweinsburg, R.E., Kolenasky, G.B., Juniper, I., Robertson, R.J., and Luttich, S. 1980. Proceedings of the 7th meeting of the Polar Bear Specialists Group IUCN/SSC, 30 January-1 February, 1979, Copenhagen, Denmark. Gland, Switzerland and Cambridge UK, IUCN., pg. 45-53.http://pbsg.npolar.no/en/meetings/ pdf of except here. This entry was posted in Population, Sea ice habitat and tagged abundance, Amstrup, Beaufort Sea, Bromaghin, Derocher, low survival, mark-recapture, models, polar bear, population estimate, population recovery, Regehr, satellite collars, sea ice, Southern Beaufort, Stirling, summer ice minimum, thick spring ice. Bookmark the permalink.